Registering Chalk & Wire as an external tool indicates to Moodle that it is allowed to communicate with Chalk & Wire. The domain is secured with a "key" and a "secret", which will be provided to you by Chalk & Wire. 5. Select Manage External Tool Types. 5. 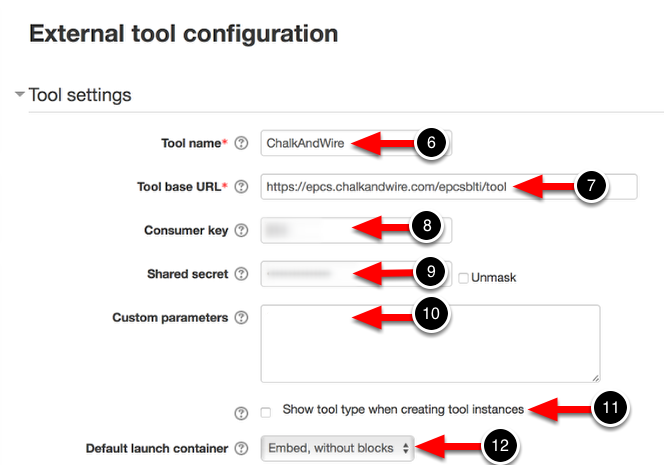 Click on the Add External Tool Configuration link. 6. Enter the Tool Name. 8. Enter the Consumer Key. 9. Enter the Shared Secret. NOTE: Both the Consumer Key and Shared Secret will be given to you by Chalk & Wire. 10. Do not enter any Custom Parameters. 11. You MUST select the Show tool type... option to have this tool show up when adding the LTI link to a course. 12. Leave the default option for the Default Launch Container. 13. Click on the Privacy tab to drop down additional options. Use these options to define the parameters that will be sent to Chalk & Wire. 14. Click on the Save Changes button.